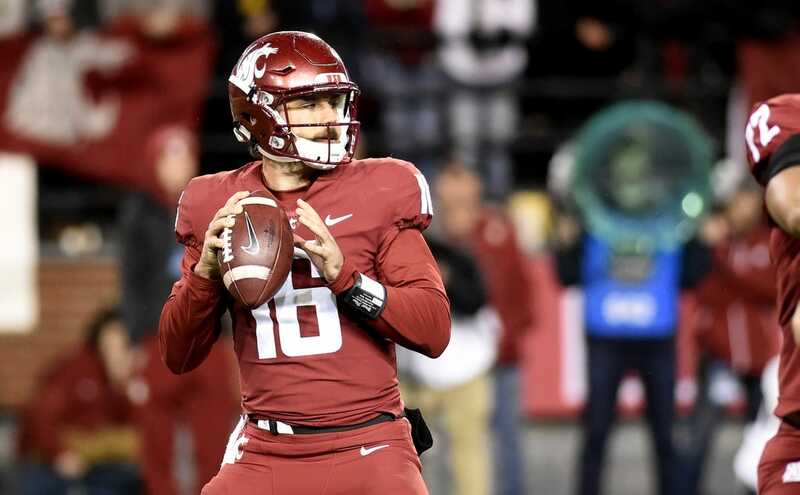 Gardner Minshew drove eighth-ranked Washington State 69 yards and broke a tie with a 10-yard touchdown pass to Easop Winston with 38 seconds remaining Saturday night, allowing the Cougars to escape a scare from California with a 19-13 win in Pullman, Wash. The win allowed Washington State (8-1, 5-1 Pac-12) to remain atop the Pac-12 North and keep its playoff hopes alive with a fifth straight win. Cal (5-4, 2-4) had a two-game winning streak ended. After taking over at his own 31 with 2:39 left in a 13-all tie and needing only a field goal to win, Minshew completed a 23-yard pass to Jamire Calvin and a 24-yarder to Winston on consecutive plays to advance the ball to the Cal 10. But instead of running down the clock and going for a field goal, Minshew threw to Winston in the right corner of the end zone for the game-winning score on the next play. The Cougars failed on the PAT. Cal got no farther than its 21 on its final desperation drive. Skyler Thomas put Washington State in a position to win when he intercepted a Brandon McIlwain pass in the end zone with 7:40 remaining in a tie game. Cal had driven from its 12 to the Washington State 12, where the Bears had a first down before Thomas' interception. But Blake Mazza missed a 30-yard field-goal attempt with 3:36 to play. Nonetheless, the swing in field position ultimately worked in the Cougars' favor. Cal pulled even at 13-13 with 2:04 remaining in the third quarter after getting a huge break on a Chase Garbers pass that was intercepted by Willie Taylor. Garbers hustled into position to tackle Taylor just short of the goal line, forcing a fumble that, after a mad scramble in the end zone, went out of play for a touchback, giving the ball back to the Bears. Cal then drove into position for a 46-yard field goal by Greg Thomas to tie the score. Minshew, the nation's leading passer, finished 35 for 51 for 334 yards with one touchdown and one interception. Winston hauled in seven of the passes for 92 yards and the lone aerial TD. Garbers went 15 for 26 for 127 yards with one touchdown and one interception. Bears rushing star Patrick Laird was limited to 40 yards on 18 carries. Cal's defense held Minshew without a touchdown pass in the first half, yet the Bears found themselves down 13-10 at the break after two Mazza field goals, the second coming with one second left in the half. Minshew passed for 202 yards in the half and the Cougars outgained Cal 239-117, but Garbers had the lone touchdown pass of the first 30 minutes, a 2-yarder to fullback Malik McMorris that gave the visitors a brief 7-3 lead in the second period. Max Borghi had Washington State's only touchdown of the half on a 5-yard run that put the Cougars back on top 10-7 with 6:47 left in the second.